What is Mini Tennis Coaching? 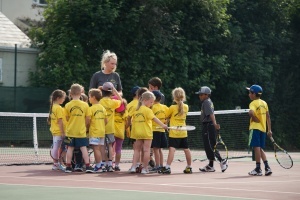 Mini Tennis is a fun, educational tennis coaching programme designed for children between the ages of 4-10 years. The game is designed primarily for children but it’s a fun way to play tennis for all abilities and ages. It allows young or inexperienced players to learn the skills and tactics of tennis and actually play the game. The Tennis Heaton Programme uses the LTA’s Mini Tennis concept which involves three colour-coded stages in the sequence of traffic lights that chart children’s progress in tennis, Red, Orange and Green. Children gradually progress through the stages according to ability. In the process, the court size, racket length, ball speed and the length of games all increase until the player is ready to move onto the full game. The skills children learn in their formative years will enable them to embrace an active lifestyle throughout their lives.Tennis stimulates the mind, body, and emotions and fosters cooperative and competitive skill development. Research indicates that tennis can cut the risk of heart disease; help improve social skills, teamwork, concentration, and discipline; it reduces stress; and burns more calories than many other well known sports. The great thing about tennis is that it is free of limitations based on gender, physical size, and age. Mini Tennis Red is the first stage of Mini Tennis and is very important for building general sporting skills, but it also helps to develop each child’s confidence. The emphasis is on fun and players can develop the basic strokes and learn the rules through playing fun team games and exercises. 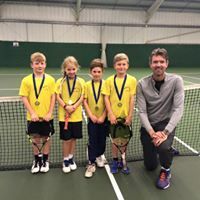 As Children progress through Mini Tennis Red they will be introduced to rallying and playing the game leading to fun competitions and inter club leagues. Both singles and doubles are played on this court. Indoor play: 8cm sponge ball or Mini-Tennis Red ball. Outdoor play: Mini Tennis Red outdoor ball – larger than a tennis ball, gentle low bounce. Depending on the size and strength of player – 43cm – 58cm (17”- 23”) in length. A maximum length of 58cm (23”) is recommended for safety reasons. Primarily 4 – 8 years. Scoring is tie break style, very flexible, to 7 points or extended to 11 or other. Competitions are a maximum of 2 – 3 hours long. They are often in a team format. Mini Tennis Orange introduces children to playing on ¾ length tennis court. The low bounce Mini Tennis Orange ball slows the game down to a speed which gives players time to play the good basic tennis shots and enables them to have maximum fun playing the game! The emphasis continues to be on developing the fundamental sporting skills as well as hitting shots just like their favourite stars. 18m long, ¾ of the length of the full court. The orange base line is half way between the service line and full court base line. Width as normal court and net as normal net. Singles court for Orange singles, doubles court for Orange doubles. Mini Tennis Orange ball – tennis ball size, softer and lighter than a normal tennis ball. Normally 7 years upwards depending on ability and the age at which child started to play. Scoring is tie break style, two tie breaks or best of 3 tie breaks. Mini Tennis Green is the final stage before children move to tennis. Played on a full size tennis court, the Mini Tennis Green ball is slightly lower bouncing than a normal tennis ball and helps children to use good technique and rally consistently. Physical skills continue to be an important part of lessons but there may be more emphasis on children playing competitions with scoring moving towards full tennis scoring. Mini Tennis Green ball – tennis ball size, softer and lighter than a normal tennis ball. Normally 8 years upwards depending on ability and the age at which child started to play. Scoring is tie break style, best of 3 tie breaks or proper tennis scoring with shortened format. For example – one ‘short’ set with tiebreak at 4-4. Competitions may be longer but still with an emphasis on team events. Mini Tennis coaching is the best way for children to learn tennis. Research shows that it is essential for children up to the age of 10 years to learn the physical skills of running, jumping, balance, co-ordination, throwing and catching as well as basic tennis skills if they are to reach their full sporting potential . Expect to see lots of these activities in Mini Tennis lessons at Tennis Harrogate. Allow your children to play in the Mini Tennis colour stage that is appropriate to them. This will ensure they enjoy playing the game and gain confidence. Purchase balls and rackets, which match the stage that your child is in. Play with your children whether in the park, the garden, or on holiday. Any ball games, running activities or tennis on appropriate courts will be beneficial. Encourage them to play other sports too. Be patient. Children will rarely progress steadily but more often progress in peaks and plateaus. Encourage your children to take part in competitions at the club. These will be relaxed and varied plus there will be a strong emphasis on team and multi sport activities. Familiarise yourself with tiebreak scoring, offer assistance when needed but avoid scoring your own child’s matches. As a spectator always be generous in your applause for both players in a match. Don’t tolerate bad behaviour, cheating or bad manners from your child. Help your child to understand that showing respect for the rules, opponents and officials is all part of tennis. During tennis coaching sessions respect the fact that the coach is there to deliver the session, it is not appropriate for parents to get involved in coaching from the sidelines. Mini tennis is played in the same way as tennis and therefore the rules are the same of those applying to the full size game. For coaching and teaching purposes and for some competitions, the rules can be adapted according to the ability of the children involved. Parents play a crucial role in both the introduction to tennis and the earlier stages of development. Research indicates that most children get their first tennis experience from a parent. Parents can play an introductory role even with young children (ages 3-6). These children should be introduced to striking and receiving skills, and objects such as balloons, bean bags and foam balls are ideal for throwing, bouncing, balancing and catching. After throwing and catching skills are acquired, children can learn to rally. Start with foam balls and short rackets; children can learn to rally with a parent in a driveway or car park. Simply rallying a foam ball over a line and graduating to a low net (using a string or caution tape) is great fun for both children and parents. As the child develops rallying skills, a tennis court could be used so the rally goes over the net with the service line counting as the baseline. Moving from a foam ball to a low compression tennis ball is the next step. It is relatively easy to keep the ball in play using a ¾ sized court and the low compression ball.